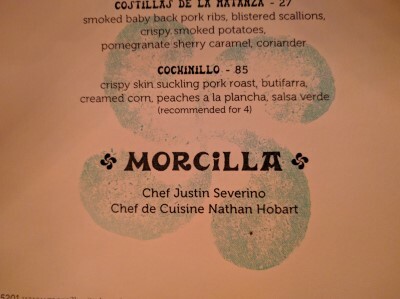 In June I started suggesting that we return to Morcilla. We both had really liked the restaurant when we went in January but we hadn't been back. As usual, life interfered, and before we knew it, it was August and we still hadn't returned. 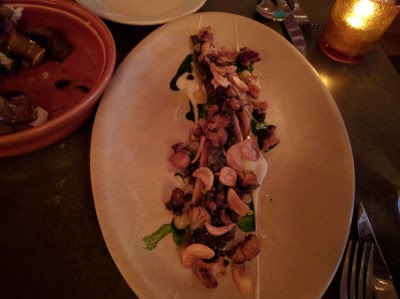 Then Morcilla was named one of the Top Ten New Restaurants 2016 by Bon Appetit. I said to SP that we had to return, soon, before it became too difficult to get a reservation without planning weeks in advance. So we made a reservation for 2 weeks from that conversation and finally found ourselves back at Morcilla, although this time on a hot & humid August day instead of cold & wintry January day. This time, instead of sangria, which is very good, I decided on wine. 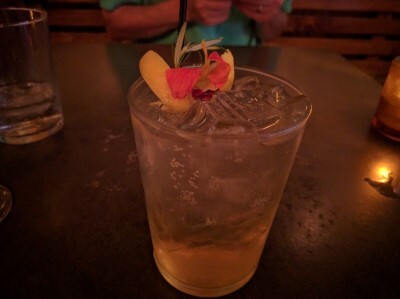 I enjoyed 2 glasses of albarino while SP first had a cider and then a gin cocktail. 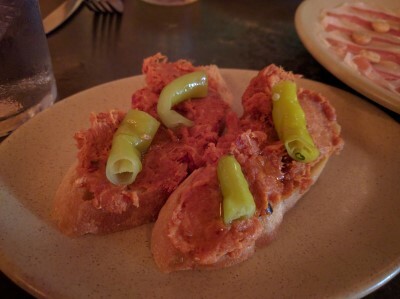 Sobrasada (spreadable smoked pork salami, pimentón, dried chilis, crispy bread, guindilla). 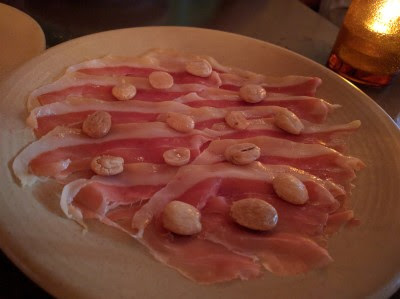 Serrano Ham (marcona almonds). I love this ham. I ate more than my half. I don't feel bad about that. Much as I love the Serrano Ham, I think this might have been my favorite: Montaditos, Oxtail (caramelized onion, Mahón cheese). So good we ordered a second one. 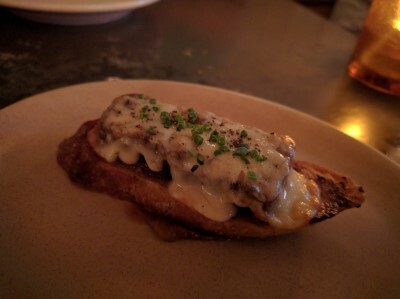 The toasty bread, the melted cheese, the sweet carameized onions, the tender oxtail. So. Good. 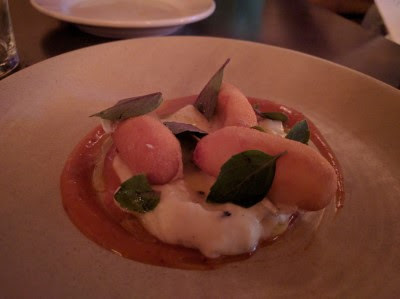 Of course I also did a good job of inhaling the Queso de Cabra (smoked goat cheese, creamed corn, spicy peach marmalade, basil). Smoked cheese. Enough said. 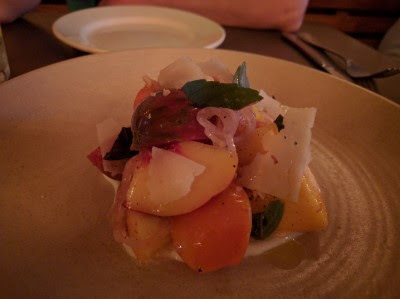 Tomatoes and Peaches (idiazabal cheese, marcona almonds, sherry vinaigrette, basil). Tis the season and these tomatoes & peaches were excellent. garlic, preserved lemon, parsley). He was happy to do so and I swear he made some happy noises as he ate. Meanwhile I was focused on this favorite: Cordero en Moreno (Jamison Farm spiced lamb meatballs, sumac yogurt, golden raisin and leek escabeche). Lamb. Yogurt. Yum. Dessert: Churros (hazelnut chocolate, cinnamon crema). Just enough for a little sweet treat after eating all that food. This time I refrained from spooning the chocolate sauce into my mouth. That's because I used my churro to scoop huge globs of the sauce into my mouth. 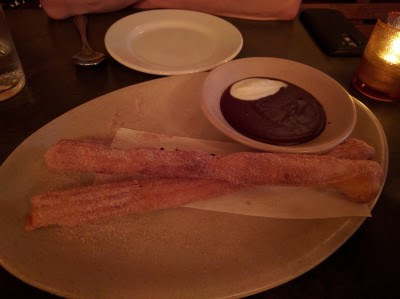 I could probably eat both churros so maybe next time I'll get my own order - then I won't have to share! I'm happy that the food was just as delicious as I remember and our server was as lovely as last time. Our food arrived at a nice pace and we never felt rushed. I don't like to declare a restaurant "my favorite" or "the best" because depending on my mood or the occasion or the company, it varies. There are a lot of great places in Pittsburgh. 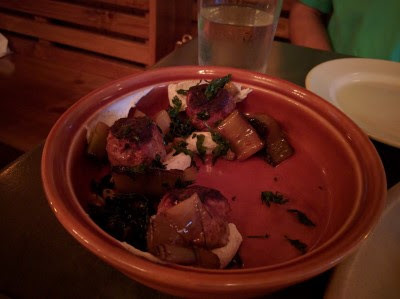 Morcilla is definitely in the top 5 of my personal favorite places in Pittsburgh list.